This was my first year celebrating Thanksgiving outside of the United States. Having spent all of my previous Thanksgivings celebrating with my family in the Midwest, this celebration was a little different, but I’m sure will be a little more memorable for this reason. Fourteen hours ahead of my family back home (due to the considerable time difference), I gathered to celebrate Thanksgiving in Mongolia with an assortment of American and Mongolian friends. Our table of food — covered with everything from apple pie to latkes to spicy fried rice to Mongolian buuz (steamed dumplings filled with meat) — reflected the diverse backgrounds of the attendees of our gathering. At the same time, the diversity of people and food present reflected the diversity of American culture perhaps more accurately than my previous Thanksgiving celebrations in the US have been able to. And while some of the elements of Thanksgiving that I’m used to were missing this year — I wasn’t with my family, didn’t get the day off of work, and didn’t have turkey — the purpose of Thanksgiving was successfully achieved: I spent the evening reminded of my gratitude for the people I was gathered with and the meal we were sharing together. And perhaps I was just a little more mindful on this particular Thanksgiving of how very American Thanksgiving is, yet just how universal it is to give thanks. 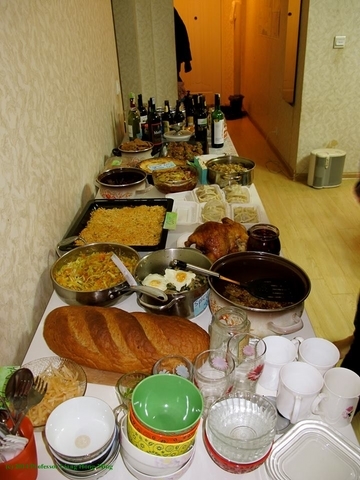 It is interesting to see the Thanksgiving food in Mongolia, which is different from the American Thanksgiving tradition. Also I wander why these two countries share the same holiday with different food. Is it because they have different agricultural methods and location? Based on my knowledge, Thanksgiving is not as common in Asian countries as in West. However, as the author pointed at the end of the report, it is universal to show gratitude in some particular holidays. I think it is cool that I found this article now because Thanksgiving 2014 is right around the corner. What I like about this article is that it discusses what I feel is the most important part of Thanksgiving, being thankful. It is nice to eat a lot of food and see family, but more importantly I think it is good to remember what we have and be thankful for it. I thought that it was very interesting that you celebrated thanksgiving in Mongolia. Like you said towards the end of the article “And perhaps I was just a little more mindful on this particular Thanksgiving of how very American Thanksgiving is, yet just how universal it is to give thanks.” I feel like people tend to forget this that just because we have a holiday specifically called thanksgiving that doesn’t mean other cultures don’t have a holiday like it or even going back to the idea that giving thanks is universal. Awesome article!